When I was born we already had a dog in the family, a Labrador cross called Tina, but it wasn’t until 1980 that I got involved in dog training with my mum when we fell in love with a rescued Labrador. He was 10 months old & was as crazy as any 10-month-old puppy with no training. He was called Boris and was the beginning of our journey into dog training. We took him to classes in Brookwood, known then as Brookwood Dog Training Club, and these are the classes I now run. After a few years, we started going to obedience shows and found we quite enjoyed that side of it. As Boris was getting older & nearly ready to retire from competition mum decided to get a German Shepherd in 1985. By this time I was also hooked and was going to all the shows with her and tried competing in some of the fun classes. In 1987 I was finally allowed a dog of my own, an English Springer I called Alpha. We competed together plus he did some acting and modeling too. 1987 was also the year mum and a friend of hers took over running the classes that we’d been going to for the last 7 years. I was also there as a helper, assisting them with a little teaching as well as talking to visitors about the classes. I had already taken on a bigger role supporting her and got a qualification from the British Institute of Professional Dog Trainers in 1997, exactly 10 years after mum had done. Mum continued to run the classes until 2001 when her health forced her to stop. I then took over running the classes and expanded creating Puppy classes as well as adding outdoor classes at Merrist Wood College. Another expansion has been to offer Home Visits. 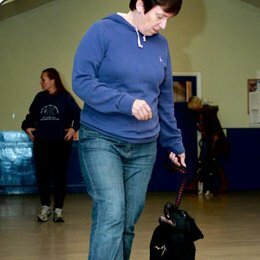 As well as running Brookwood & Normandy Dog Training I also spent a couple of years teaching for another club where I taught the Beginner Class. This included preparing them for the Kennel Club Good Citizen Scheme Bronze Award. I am also a Member of the Professional Association of Applied Canine Trainers and an Ambassador for Butternut Box Dog Food. At Brookwood & Normandy Dog Training, we offer a choice of training solutions, private lessons/home visits and classes (puppy, beginners or intermediate). Private lessons can be for behavioural issues or pre-vaccination visits for young puppies or obedience training. Home visits are also available if you find class times don’t suit or if you would prefer to do all training at home. 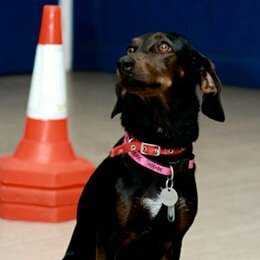 Our classes are suitable for puppies and dogs of all ages and abilities. We offer courses of classes for puppies, beginners and intermediates. If you are interested in our classes, please contact us to find out about course dates and availability.